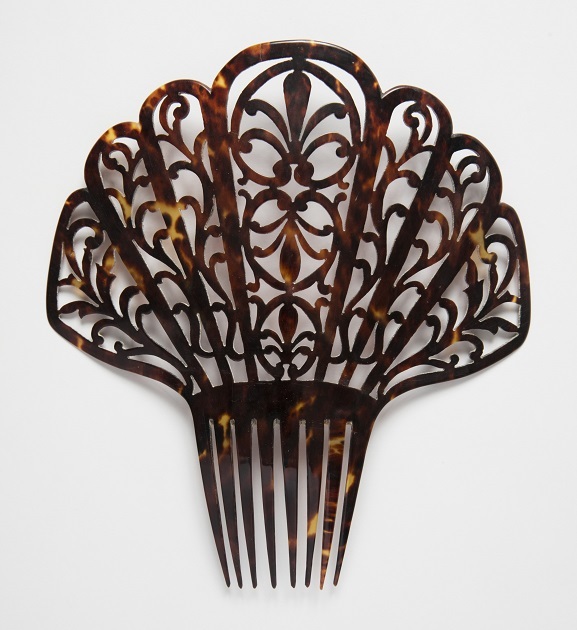 Ornate tortoiseshell combs called peinetas were brought to Spanish-held territories in the 18th century, and by the 19th century, they spread across Puerto Rico, Cuba, Mexico, Peru, Brazil and the southern-most region of South America. They became intricately designed and oversized, such as the peineta pictured here, which dates from 19th-century Cuba. Peinetas typically hold up mantillas, the lace or silk shawls that cover a woman’s head and shoulders, and they came to symbolize a woman’s individuality and entrance into society. For centuries, tortoiseshell was a luxury material valued for its marbled appearance, translucency and durability. Simulated tortoiseshell made of celluloid, the first thermoplastic, became available by the 1880s. It was less costly but as appealing as the real thing, and imitation tortoiseshell combs and hair ornaments replaced tortoiseshell, which has been unavailable since the 1970s. This peineta is in the Cooper Hewitt, Smithsonian Design Museum’s collection. It is not on view.